It seems like only yesterday, but it’s been 50 years since the San Diego Aerospace Museum opened its doors for the first time. Since then, we’ve moved twice, added an annex at Gillespie Field, acquired the original Consolidated Aircraft Wind Tunnel and increased our aircraft collection from six to more than 120. But most importantly, we’ve positively impacted more than 15 million people—providing a world-class learning experience and inspiring youth to excel in their lives. Today, as one of our nation’s five largest and most comprehensive aero-themed museums, the San Diego Air & Space Museum is the official Air & Space Museum and Education Center of California and home to the third largest aviation archives and library in America. 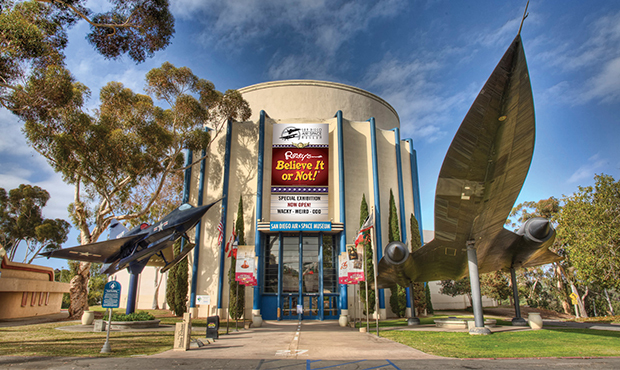 As the only aviation/space center of excellence in our region with accreditation from the American Alliance of Museums (determined by a rigorous process met by only 4% of Museums nationally) and one of only three Smithsonian affiliates in San Diego County, your San Diego Air & Space Museum has a strong and proven record of upholding the highest standards of excellence and achievement. Manage and preserve more than 120 aircraft and related artifacts. With your help, we’ve recently completed the installation of an environmental control system in our collection storage area. Continue digitization of our image and video collection, which dramatically increases public access to our archives. More than 145,000 images have been uploaded to Flickr.com. To date, there have been more than 10 million views. Continue extensive aircraft restoration and construction projects in our world-class restoration department. In 2012, we began work on the famed Hughes H1 Racer, Chuck Yeager’s Bell X1 Rocket plane (first to break the sound barrier) and T-34B. Showcase extraordinary special exhibitions that attract a broad and diverse audience and allow us to enlighten, intrigue and inspire visitors of all ages and backgrounds. Our current Ripley’s Believe It or Not! exhibition is a rare and captivating intersection of culture, history, technology and innovation that debuted to rave reviews and record-breaking attendance numbers. Use interactive exhibits and stimulating programs to pique children’s interest in STEM fields at every age and every opportunity. As you may know, Science, Technology, Engineering, Math and Innovation are critical components of a growing economy—especially in Southern California’s high-tech region. Award college scholarships to San Diego County’s most deserving students each year (nearly 250 scholarships bestowed since 1989). Continue to expand and enhance our educational and family programs, including: Space Day, Paper Airplane Festival, AeroSummer Camp and Family Days. Impact nearly 10,000 K-12 San Diego County students each year through field trips, outreach programs and in-Museum classes that meet state education standards. Recognize air and space legends at our annual International Air & Space Hall of Fame Induction Celebration. More than 175 of the world’s greatest aviation and space pioneers have been inducted since 1965. Commemorate the milestones of significant air and space achievements. In 2012, we honored the 40th anniversary of Apollo 17, as well as Mercury, Gemini and Apollo astronauts. Published Celebrating: a History of the Museum and its Collections, an invaluable guidebook for Museum visitors and an excellent reference source. Join in our celebration and help us celebrate 50 years of excellence! Click here to donate to the Museum today.